Let me take this opportunity, on behalf of President Maithripala Sirisena and the people of Sri Lanka, to extend my warm felicitations to Your Excellency on your election as Chair of the Non-Aligned Movement. It is my firm belief that under your able stewardship our Movement will be further strengthened in the years ahead. We are at historic crossroads as far as the global development agenda is concerned. For over fifty-five years, the Movement has advocated that the international community needed to look at the larger development issues in addition to political issues. With the 2030 Agenda for Sustainable Development, being adopted just one year ago, and nations across the world, poised to implement Sustainable Development Goals at national levels- it is clear demonstration that development issues affect all countries, and not just those in the South. It clearly vindicates our Movement’s championing development as being at the core of a country’s progress, that should be addressed holistically and not through selective criteria or as secondary goals. The theme adopted for this Summit “Peace, Sovereignty and Solidarity for Development”, is therefore extremely relevant and timely. They require our unwavering commitment towards the maintenance of global peace, upholding the sovereignty of developing states, as well as strong solidarity among the countries of the global south, if we are to reap the benefits of the SDGs for the betterment of our peoples. The Movement should continue to be a champion of these causes, with a view to ending poverty in all its forms and dimensions; protecting our planet’s delicate ecosystem from further degradation; and ensuring that all human beings can enjoy prosperous and fulfilling lives. It is a cause for satisfaction that I am able to inform this assembly that the ratification of the Paris Climate Change agreement was unanimously endorsed by the Sri Lankan Parliament only last week. Sri Lanka remains firmly committed to ensure that “no one is left behind” in line with the key principle of the 2030 Agenda for Sustainable Development. Sri Lanka has been fortunate, that successive Governments since independence have adopted universal free education and free health care policies, that have produced some of the highest social indicators in the region. However, there are challenges we face, from a legacy of conflict and a number of problems that have not been addressed. As a middle income country, our focus is in eliminating economic inequality and further reducing poverty – a focus of our President, Maithripala Sirisena’s, programme to combat disparities in our society. “The people of Sri Lanka elected a new President and a new Government in two consecutive elections during the last eight months. Within the first six months, my Government introduced essential amendments to the Constitution in order to strengthen democracy in Sri Lanka. These amendments have reinforced the foundations of good governance through institutional reforms that strengthened pluralism and democracy. With my personal intervention and facilitation, some of the executive powers vested in the Presidency were transferred to the Parliament and other independent institutions. Our threefold aim, Mr. Chairman, is to strengthen democracy, attain peace through reconciliation and foster economic development. To support this process, we are in deliberations to introduce a new constitutional instrument that will help attain our goals. The present Government of President Sirisena, voted into office by all segments of the Sri Lankan population, is based on the principles of consensus building and national unity. It is committed to reconstruction and economic advancement leading to comprehensive reconciliation. Our new vision for the country involves achieving the objectives of sustainable development, peace and reconciliation. A fundamental requirement in this context is dealing with the past honestly and building a modern Sri Lankan Nation. In order to achieve sustainable development, there must be global peace and security that can only be achieved through adhering to the purposes and principles of the United Nations Charter and the principles of international law. Resorting to multilateralism and peaceful settlement of disputes among nations is of the utmost importance. At the national level achieving Development Goals becomes impossible without good governance, rule of law and respect for human rights. As much as global peace is an essential element in our quest for development, global security is of equal importance for that purpose. Despite our collective efforts to make it a safer place, the world is increasingly becoming a perilous place, with the proliferation of nuclear weapons, terrorism, violent extremism and conflict. As a country that had experienced the agony of a long conflict for decades, Sri Lanka is of the firm view that terrorism in all its forms and manifestations must be eradicated. As much as we rise to the challenge of terrorism, violent extremism and conflict, it is equally important to prevent conflict. In this regard, effective peacebuilding, addressing the root causes of conflict as well as ensuring non-recurrence become vital. In this context, we stress the need for adequate, predictable and sustained financing for the UN peacebuilding efforts. We express our deep regret that the question of Palestine remains unresolved for a period of almost seven decades. Sri Lanka has consistently supported the implementation of UN General Assembly Resolutions regarding the inalienable rights of the Palestinian people to statehood and the attainment of a two State solution. Solidarity among the nations of the global south, in particular among the nations of our Movement is our greatest strength. However, we must make more meaningful efforts to deepen and enhance South-South cooperation in our quest for sustainable development. To preserve the inclusivity of the new global development agenda, it is imperative to empower our women to be equal partners in achieving Sustainable Development Goals. We must also ensure to keep youth, children and persons with disabilities at the centre of our developmental efforts. 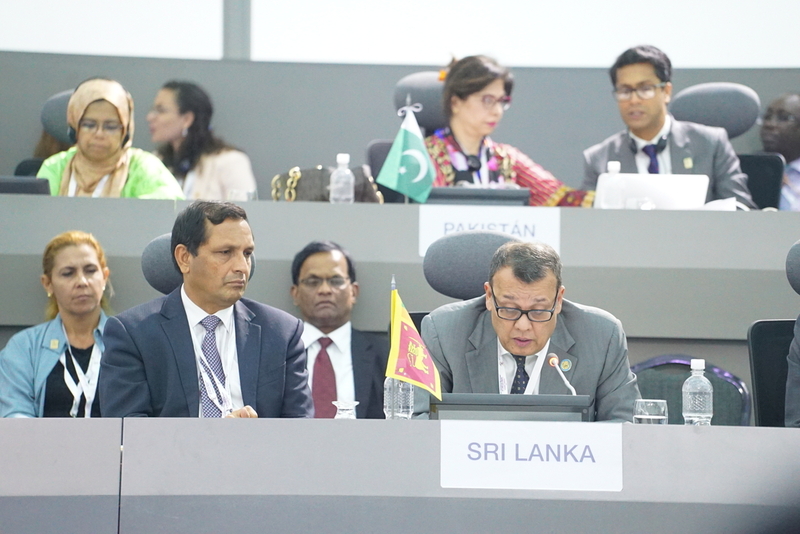 In conclusion, I wish to strongly reiterate Sri Lanka’s commitment, as a member state of the Non-Aligned Movement, to continue to play a very active and responsible role, adhering to its founding principles, ideals and purposes, in order to realize a peaceful, prosperous, just and equitable world. I conclude with a quote from our President, Maithripala Sirisena, who last September said “A new era of democracy dawned in Sri Lanka on January 08th 2015 ushering in justice, freedom and equality. Our social and human development approach is founded on pluralism, reconciliation and sustainable development.” This is, I believe is the way forward for our people, our communities, our countries, regions and globally. I wish the Summit every success.